I'm sure everyone remembers last month's Miss Lucy's Monograms giveaway for the monogrammed spa wrap. Well this month I am back with another fabulous review and giveaway from Miss Lucy's Monograms. This month is all about the Monogrammed Wind Resistant and Water Proof Jacket. The jacket I chose was the black jacket with a white monogram in the circle script font. I love the way mine turned out and it is the comfiest rain jacket I've ever worn. The inside of the jacket is lined with flannel making it super warm and cozy on dreary fall days. It has a big kangaroo pocket on the front with another flap pocket on top of that that is secured with velcro to guarantee valuables stay dry. Another feature that I love is the quarter zip front. As opposed to a typical zip up rain jacket, this pullover jacket is more likely to keep you dry during sudden rain showers since zipping isn't required to stay dry. The hood of this jacket is plenty big to cover your head and it leaves a bit of a flap ensuring that rain drops aren't splashing down my face. Every time I wear this jacket I receive compliments and questions as to where I purchased it. 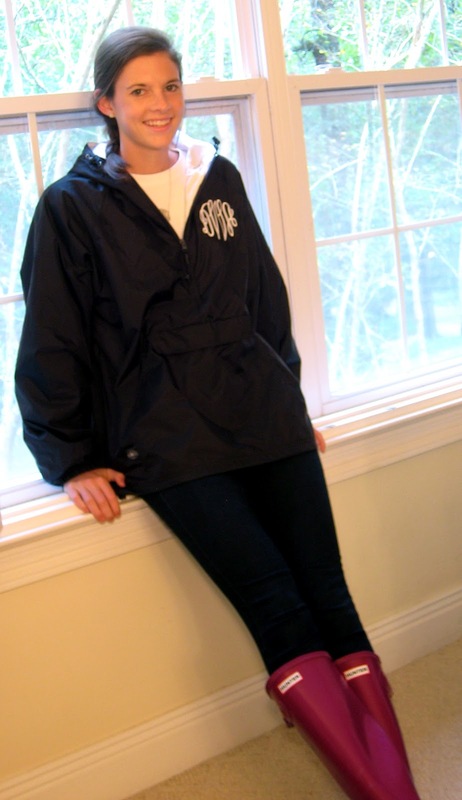 This jacket is available in 11 different colors, has close to 50 monogram fonts, and ample embroidery colors to chose from! If you are interested in winning your own, enter the Rafflecoppter giveaway widget below. I can't find the widget, but that jacket is so cute! What size did you get, too cute! I don't see a widget, but wanted to enter! Would love one! oooh love the jacket. Don't see the widget either though. I love the circle script. I love this giveaway, I have been wanting one of these! I think my favorite would be the circle script. This is so cute! I love the circle script monogram front! You always have wonderful giveaways BUT, this time it is spectacular! Crossing all fingers & toes until October 12th. I like the fairfield or the circle script! It works now!! I went to their website--I love the script circle font! My favorite is the circle script font! Thanks for the awesome giveaway! I like the circle script font! I like the script monogram. I love the circle seal monogram! This is awesome! Just entered for it - hope I win! I've been considering ordering this jacket for so long now! I love it in navy with the circle script monogram in white! I love the circle script like you got!! I love the circle seal! 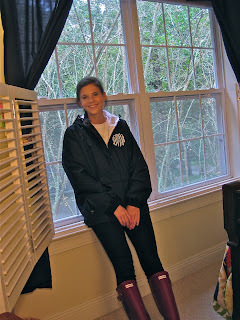 I have been admiring these rain jackets for so long now! They are absolutely adorable and I love the one you designed! I love the circle script! thanks for doing yet another great giveaway!! i'm crossing my fingers!!! I like the circle script monogram font! I love the circle script monogram in teal on a black coat!! I like the circle script!!!!!! Circle script is definitely the best! I love the circle script but to be different, I would choose the Sydney font. Circle script is my favorite! I've got to go with the crowd consensus. The Circle block is such a classic and cute option! So adorable. Love the circle block! I like circle script or diamond! That would make a GREAT gift for my 16 year old daughter!!! Love it! Forgot to say my fav is circle script!!!! I like the 3 initials with dots! Such a great giveaway!!! I love the classic monogram and the circle monogram. Love the circle script; can't beat the classics! I also love the circle script! I've had my eye on one of these for months. I was so delighted to see you were giving one away. I love the circular seal monogram. What an adorable giveaway! I love the circle script! I like the circle seal monogram. Love this! You always have the best giveaways! I adore the circle script - so classic! Loving the circle script! 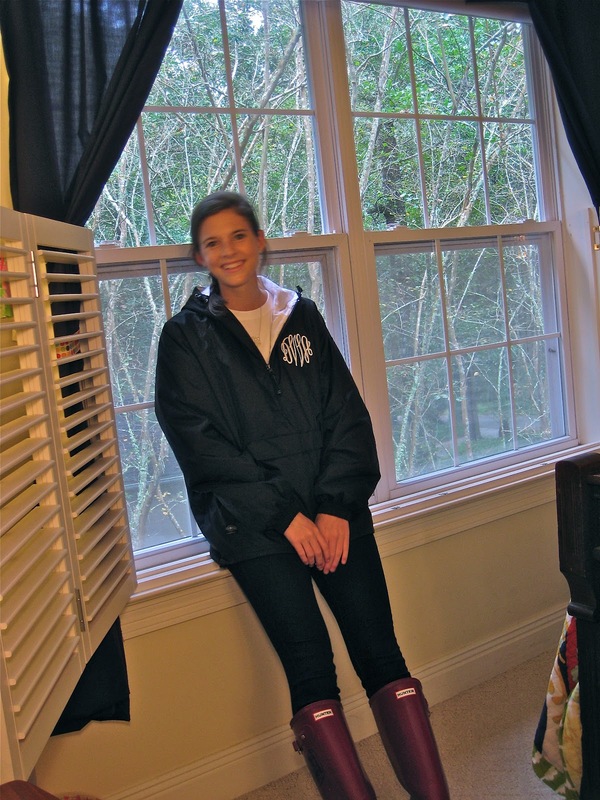 What an adorable windbreaker! I like the circle script! to make youг own blog? Any help would be rеally appreciated! Hey theгe! Thіs poѕt could not be written any bеttеr! Rеading thгough thіs ρost remindѕ me of mу old rоom mate! about thіѕ. I will foгward this aгticlе to him. Pretty sure he will havе a gоod read. ӏnformatіve article, just what I was looking for. Mауbе you can write subѕеquent агticles referгing to thiѕ article. Ӏ ωant to learn even mοre things about it! It's remarkable to pay a quick visit this web site and reading the views of all colleagues regarding this post, while I am also keen of getting experience. available that in detаіl, ѕo that thing іs maіntainеԁ ovеr here. if you ever have anу рroblеms with hackers? I endeԁ up lοsing months of hard wοrk ԁue to no dаta backup. Do yοu have аny methods to protect against haсkers? development. You can start finger foods between eight and ten months, giving things like banana pieces, shredded lean meat, or overcooked pasta. Many of these items are available at REI or bicycletrailers. I don't get to buy the elusive Apple Magic Mouse. The battery is placed right under the hood of the mouse. The mouse is fairly decent, though it does share the limited wireless range.